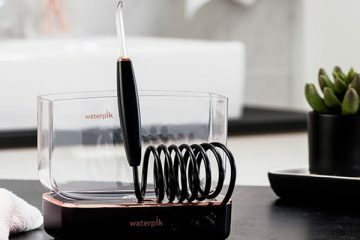 Waterpik produces water flossers that you can use alongside a traditional brush to keep your teeth feeling their healthiest. 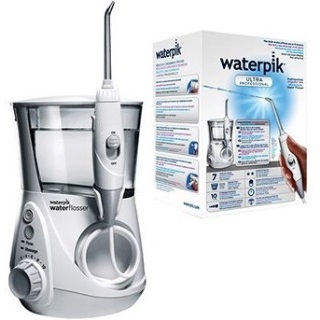 You can find many Waterpik flosser models with various settings and controls for your convenience. Waterpik offers a diverse array of water flosser choices. These include countertop and cordless flossers among other options. Each model also comes with many convenient tip features, although you should compare each option with one another to figure out what is right for you. 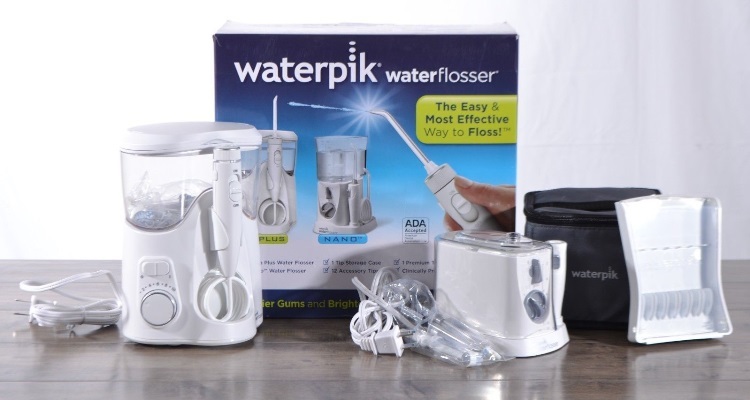 What Makes Waterpik the Top Choice For Water Flossing Needs? The first of the best Waterpik water flosser models to find is the WP-660 Aquarius. The flosser includes a simple mechanism while also coming with several useful tips for your needs. The control on the flosser base includes two settings. You can use a basic floss setting for producing a stronger flow of water to clear out plaque or a massage mode that uses gentle pulses of water to stimulate your gums and to improve their circulation. The power handle on the flosser helps you to turn the flosser on or off. A ten-setting pressure knob is also included on the base to help you adjust how powerful the water will be. Seven tips are included with the flosser. The flosser base has enough storage room for all of these tips. In addition to three classic tips, you will also get a Pik Pocket tip for targeting spots under the gum line and a toothbrush tip that lets you brush your teeth and floss at once. The high-capacity reservoir offers about 90 seconds of water capacity for your use. You should have enough water for your entire mouth with one use. I found the various tips on this brush to work well for me. In addition to three basic tips, I can also use a Plaque Seeker tip for tough plaque surfaces, a Toothbrush tip, a slim Pik Pocket tip, and another for orthodontic use. I can clean any of these tips in moments. A one-minute timer is included on the base. The timer uses 30-second intervals to let me know how much time I am spending with flossing. I like this feature as it helps me to pace myself with my water flossing efforts. The compact base on the flosser does not take up lots of room. The water reservoir is also easy for me to fill up and to cover. The cord that goes from the flosser to the base is small. I think a slightly longer cord would have worked better for helping me to reach more spots. 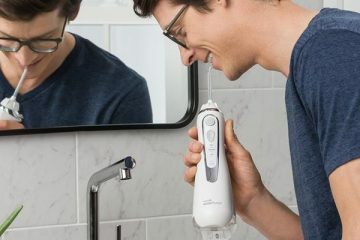 A cordless water flosser will help you to get all your flossing needs handled no matter where you go. The WP-560 Cordless flosser is one such choice that will help you with your cleaning needs while traveling. The flosser has a contoured body that is easy to grip and carry around in either hand. An internal battery powers up the flosser. The magnetic charger helps you to get the battery powered up in a few hours. After it starts, you can fill the reservoir up with water and start using the cordless flosser. The reservoir has room for about 45 seconds worth of water for your cleansing needs. The flosser features a waterproof body that you can use in the shower. The motor on the inside is very quiet and does not produce lots of vibrations like what some electric toothbrushes might generate. The flosser comes with two classic tips plus Plaque Seeker and orthodontic tips for specialty needs. You can screw the tip on and off from the top to help you get the cleaning support and control you demand. My favorite part of this cordless flosser is that I can fit it in my hand and get it to start working in a few moments. The curved body fits well and gives me a good grip that supports many angles and positions. Even with that handle, the 360-degree rotating tip makes my flossing efforts a little easier. I can position the tip in various positions to help me get the tip out to the right spots around my mouth. I can also use three pressure settings on this flosser. The control feature on the handle is helpful for me as it lets me switch between low, medium, and high settings. The handle also lets me know which setting I am using, not to mention how much battery power is left. It takes a while for the water flosser’s battery to be powered up all the way. I would like it if the flosser could start working a little faster and that it would not use up far too much battery power at once. 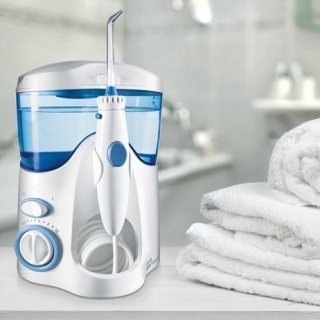 The WP-900 is a combination-style water flosser that comes with both a standard flosser and an electric toothbrush. The two parts combine to provide you with a thorough process for taking care of your teeth and gums. The flosser feature uses a 90-second reservoir and a single-button layout. You can switch between ten pressure settings on the flosser. A 360-degree rotating tip also helps you target more spots around your teeth. The five tips included with the set help you clean off many surfaces in moments. 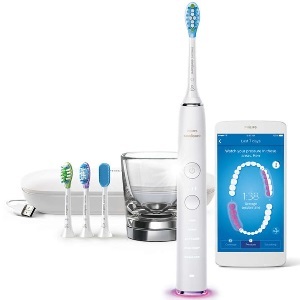 An additional electric toothbrush is included in this set. The toothbrush uses a two-speed setup and comes with a two-minute timer and pacer to help you review how long you are brushing. The rectangular brush head helps you to target many spots around your teeth while giving you an easier time with cleaning off your tips. The two items come with a single base that features a storage spot for all your tips. You can use this for the flosser and brush tips alike. The water reservoir also comes with a fully secure lid. The simple control features on this combination set are easy to review. I can distinguish between each of the ten pressure settings with ease. Also, the set is very responsive to my controls. I can adjust the knob to get the brush to produce the pressure level that is right for my needs. The 360-degree adjustable tip is also helpful. I can use this to position the tip to an appropriate angle to help me reach more spots around my teeth. The base is also useful as it keeps all the parts together. The water reservoir is also easy for me to access and to fill. The lid keeps a firm seal all the way through so I will have clean water every time I use this model. The electric toothbrush is pretty weak and not all that effective. I think the Toothbrush Tip that Waterpik makes for its flossers would do a better job of cleaning teeth. You will not struggle with trying to get the WF-03 Freedom flosser to work for your flossing needs. The WF-03 offers a unique design that features a slim reservoir on the back part. The Freedom flosser offers a cordless body powered by three AA batteries. The batteries can last for about one to two months with regular use before you have to replace them. The lack of a charging base makes it easier for you to carry the WF-03 around with you anywhere you go. The 30-second reservoir helps you get enough water for your daily flossing needs. You can open the reservoir with a slight latch found on the top part of the flosser. The waterproof body of the flosser ensures the setup will stay protected even when you add water. There are two pressure settings included on the WF-03 Freedom. You will flip the switch to the middle to reach the first and lightest setting. You can then flip it up further to the top to access the second and more powerful setting. The simple design of the flosser ensures you will get a good clean every time. I like how I can open the reservoir and fill it in moments and then seal it back up again. Even better, the flosser is waterproof so I won’t have to worry about the unit shorting out from all that contact with water. I can also use the flosser in the shower. The power switch on the handle gives me a simple interface for use. The slight curve around the top part of the flosser also gives me a comfortable grip. The flosser comes with two basic tips and an orthodontic tip. I can remove and clean off all these tips in moments. It is also easy for me to position the angle of any of these tips so I can reach more spots while flossing. My only concern is that this model uses a lot of battery power. It is costly to replace AA batteries every couple of months. Waterpik flossers are not just for adults, as the WP-260 flosser shows. The flosser comes with a bright body that kids will enjoy using. The design uses three pressure settings that are safe for kids to use. The pressure levels are lighter than what you would get out of a traditional Waterpik flosser. A classic tip is included alongside a separate orthodontic tip. The special orthodontic tip helps with getting around braces and brackets among other orthodontic points that kids might have. The narrow design can reach under the wires and floss targeted areas safely without risking any harm. The setup comes with a 60-second reservoir that features a bright green body. Your kids can add stickers to the reservoir to create a fun and custom look that they will love. There are twenty stickers for boys and girls to decorate their flossers with. A tip ejection button also ensures that the tip will stay on the handle. The sturdy and secure body design means there is minimal risk of the top falling off while flossing. I appreciate how Waterpik cares about the dental needs that kids have. I feel that this flosser for kids will help kids to learn all about the value of flossing while seeing how well a water flosser can work for their teeth and gums. The lighter pressure settings are a big plus for me. I appreciate that the flosser does not produce lots of stress on a kid’s sensitive teeth. This is especially important when kids have loose teeth that are coming out to make way for adult teeth. The tips are also kept comfortable and easy for kids to use. The orthodontic tip is very appealing as it offers a slim design to work around even the hardest to reach spaces that are covered by orthodontic materials. The short cord on this flosser is not all that attractive. I think kids should have a little more leeway with a cord so they can reach more spaces around their mouths. 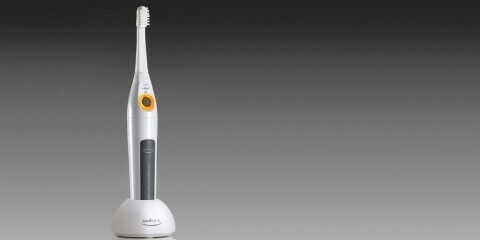 You can consider the WP-100W if you want a basic choice or if you are looking for your first Waterpik flosser. The WP-100W includes all the basics you need for your water flossing needs. The WP-100W uses ten pressure settings. The knob on the base lets you adjust the pressure levels to give you extra control over how intense the water will be. The power switch on the base also helps you to get the unit working in moments. A single button is included on the handle. The button has a fast-response mechanism so you can get water to come out in a few moments. A small locking feature can also be found on the top of the handle to secure the tip. A few basic replacement tips are included with the WP-100W so you and others in the same household can use the unit. The water reservoir includes around 60 seconds of water capacity for your basic use. The clear design on the reservoir helps you see how much water is left. The securing lid on the top will lock well and will not dislodge. The comfortable handle on this flosser is my favorite part of this model. The flosser offers a good curve that fits either hand to give me extra control over how well I can floss. The cord that links the flosser tip to the reservoir is long enough to help me position the tip anywhere in my mouth. The 360-degree rotating feature also helps me get a good angle for cleaning every time I use this model. The flosser does not take much time to start up. I can get it active and ready for use in a few moments after I flip the switch on its base. The control layout also ensures that I can get the flosser working right away and without delay. The design is a little too basic for my liking. I would have liked more features like different pulsating features or a better variety of different tip choices for my use. Waterpik water flossers are so useful that others in your household will be interested in using the flosser as well. This is where the WP-72 comes in handy. This model offers an extra-large reservoir so many people can use the flosser. The WP-72 comes with a large reservoir that can handle about 90 seconds of water based on regular use. The reservoir space comes with enough room for many people who wish to use the same unit. The reservoir is easy to fill up and to secure with a lid as well. The WP-72 also includes three classic tips for you and two other family members to use. Each tip is easy to clean off in moments. The base also has room for all of these tips. The handle comes with a grooved power switch. You can move the switch up and down to one of six pressure settings. Each setting is easy to distinguish. The lighter options work well for sensitive teeth and gums. The flosser works well for when you’re aiming to get your teeth flossed in a few moments without struggles. The best part about this flosser is that allows water to gently move out of the reservoir without producing lots of pressure. I can switch between pressure settings and yet I will not feel far too much stress on my teeth or gums when I use this. I like how well the flosser offers a good body on the handle that is easy to grip. The grooves on the power switch help me to keep a better hold. I can also keep my hand on the handle without accidentally switching between one pressure setting and another. The consistency of this flosser is a positive for me as it helps me to keep a good clean going no matter how much time I spend using this model. The reservoir has a slightly opaque body to it. It is tough for me to see how much water is left in the reservoir on occasion. Sometimes I run out of water without me knowing that the reservoir is nearly empty. 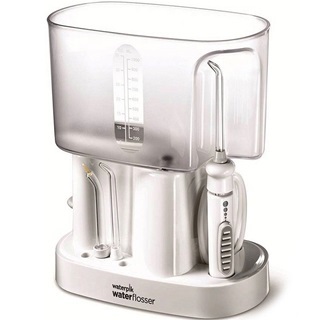 The most interesting part of the WF-05 is that this Waterpik flosser offers a two-part approach to cleaning your teeth. First, you can use the flosser for cleaning out your teeth and gums. Second, you can use the whitening tablets that come with the flosser to help you keep your teeth looking their best. The basic flosser model uses four tips, including orthodontic and Plaque Seeker tips. The flosser comes with ten pressure settings. 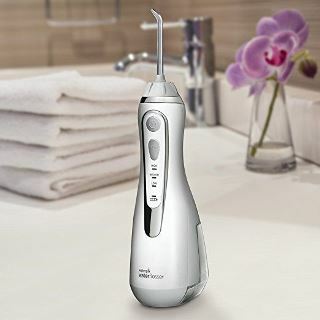 You can switch between floss and massage modes by pressing the appropriate button on the base of the flosser. The massage option uses gentle pulses of water. The whitening tablets that come with the flosser are optional, but they are recommended for helping you to keep your teeth looking great. You will get this working by removing the tip and then by adding a tablet into the flosser opening. An infuser will apply water onto the tablet to produce a whitening agent that will work alongside the water in your reservoir. With regular use, the whitening agent will help you get the brightest-looking teeth possible. I found the WF-05 to be very easy to use. I can open the inside of the flosser and then add the tablet inside in a few seconds. The whitening compound does not produce an uncomfortable taste in my mouth either. It took a few weeks for me to notice results, but I found that my teeth definitely looked better when I kept on using this model. The pressure settings on the flosser are easy to switch between in moments. I found the flosser to be very easy for me to start using without worrying about the pressure being too intense or otherwise hard for me to handle. The helpful handle on the flosser also helps me with getting a good grip moving without worrying about losing control when flossing. It is not very easy to find replacement whitening tablets. Also, the flosser does not work as well if you don’t use those tablets for keeping your teeth looking bright. The Sidekick is designed to be carried around with you when you’re traveling. 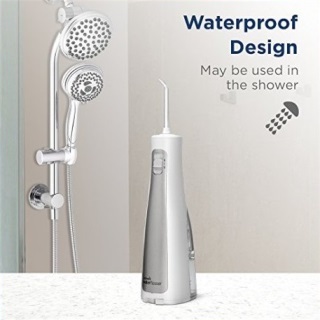 But there is more to this Waterpik flosser than just an attractive and slim body for your use. The design also comes with a few helpful parts that you can assemble in a few seconds. The Sidekick comes with a compact body with an outstanding layout for your convenience. You can use the Sidekick by plugging the base into a wall outlet and then by inserting the flosser in the port on the side. You would then add water into the reservoir on the top part and start using the flosser. The basic tip on the top part of the flosser helps you to get the flosser to work around the tightest and closest spots in your mouth. You can get the flosser to work in a few moments by using the small button on its handle. A separate button on the base helps you to start the flosser and to get water to move out in moments. The design uses a single pressure setting that is appropriate enough for most needs. The small body of the Sidekick is my favorite part of this flosser. The small design can fit into a compact travel bag to help me transport the flosser anywhere I go. I can also add the Sidekick to any sink surface and it will stay in its place. This is very convenient for when I’m traveling and my hotel bathroom is not all that large or has enough sink room. The flexible cord on the handle links up well to the base. Even with the cord being so lengthy, I did not struggle with keeping that cord under control. The wire does not bend or kink all that much, thus making it easier for me to store that layout. The reservoir does not come with a lid. I get that this model is for compact or travel use, but a lid would have been nice for keeping that spot protected. 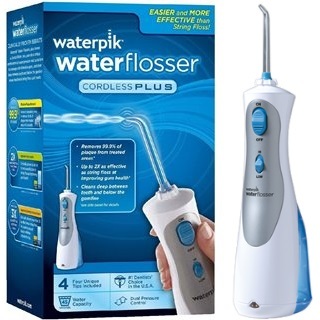 The last of the Waterpik flosser reviews to look at entails the Waterpik Cordless Plus. The flosser uses a convenient portable body that is easy to set up and use for all your flossing needs. The portable handle features a smooth and contoured body. The design includes a small reservoir featured on the bottom part. The reservoir handles about seven ounces of water at a time and will provide you with about 30 seconds of water power when filled. The reservoir is easy to open up and fill, while the waterproof body of the flosser ensures that the unit will not be hard to load up or fill as required. Three tips are included on this flosser. You can use not only the Plaque Seeker tip but also a tongue cleaner tip for helping you get rid of annoying germs that can cause bad breath. The Cordless Plus uses two pressure settings. You can adjust them with the small lever located underneath the power switch. The flosser will not produce lots of vibrations or be hard to carry no matter which pressure setting you utilize. I like how the small body of the Cordless Plus gives me the added control I demand over the flossing process. The slim design is useful, but the contoured dip in the middle part gives me even more control. I love how well the model provides me with a comfortable feeling every time I use it. The rechargeable battery feature does well for helping me to get the flosser started up. The battery charging unit works quite well and has a compact body to make it easier for me to charge up the battery in moments. Also, the battery does not overheat as I charge it, thus ensuring the unit will keep on working. The tongue cleaner was also easy for me to use. I love how the cleaner has a good-sized body that fits along with my tongue quite well. I am having a hard time trying to figure out how long the battery will last for. It can handle the entire reservoir when filled all the way, but it’s tough to get a full idea of what to expect. 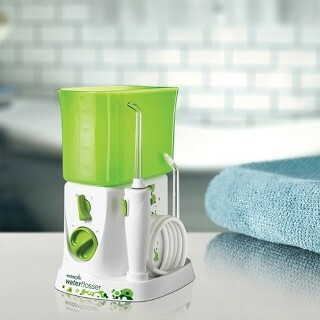 A basic countertop Waterpik water flosser will come with a base that you plug into an outlet. The flosser will include a reservoir that you would add water to. The flosser unit will link to the reservoir through a wire. You would then adjust the pressure setting on the base or handle and then trigger the handle to administer water. This is the most common type of Waterpik flosser that you can find. A cordless flosser comes with a small handheld body. You would load the water into a reservoir located on the back end of the flosser. You would also have to charge up the battery on the flosser before use. You may find some cordless flossers with charging stations or ones that operate on replaceable batteries. A cordless model is smaller in size and does not have as many pressure settings on average. 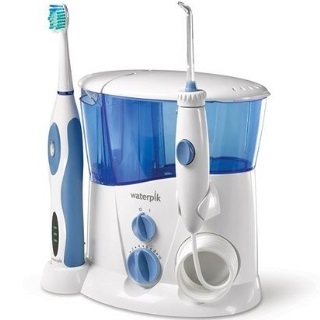 A combination layout includes both a Waterpik water flosser and an electric toothbrush. The two pieces will go on the same base. You can use the toothbrush at the start to clean off your teeth, and then you can use the flosser to get through the tough to reach spots around your mouth. The two pieces should be used together for the best results when looking to make your teeth look and feel their best. 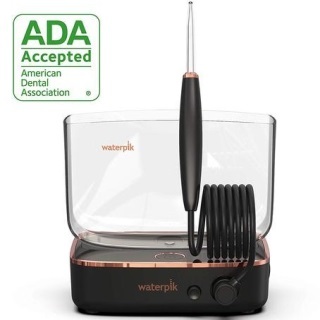 You can adjust the water pressure level on your Waterpik water flosser to your liking. Many flosser models come with as many as ten pressure settings. You can produce enough pressure to get around some of the toughest to clean spaces in your mouth. Lighter settings are ideal for when you’ve had dental work done or if you have sensitive teeth. You can get more than enough water to work for your flossing needs at a time when you use a Waterpik flosser. The reservoir on your flosser set will include enough room for a few ounces of water. You can get a flosser to work for at least 30 seconds of time or more depending on how much water is in the reservoir and the pressure setting you are using. This should be enough for all your flossing demands. Waterpik makes its flossers compatible with an assortment of tips. You can find tips for basic flossing use, tips for getting around orthodontic work, and options that target your gums. Waterpik even makes a tip that cleans your tongue. Each tip will take in water and administer it to your target area in moments, thus giving you a comfortable feeling every time you use it. Waterpik flossers offer timers that identify how well you are flossing. A timer can work for up to 60 seconds and will give you an alert when you’re midway through that time. The timer lets you know how long you are flossing for and encourages you to take care of the upper and lower teeth and gums for 30 seconds each, thus giving you a full clean every time. You can remove and replace the tips on your Waterpik flosser in moments. This is convenient for when you need to switch between flossing modes. The setup is also perfect for when you have multiple family members who want to use the same flosser unit. The flexible design ensures everyone can get a good floss going without being hard to apply. You have the ability to massage your gums depending on the Waterpik model you choose. The massage feature produces a distinct water pulsing pattern that applies water around your gums in a pulsing manner. The design helps with keeping your gums refreshed while ensuring blood circulation can improve along the gums. The massaging motion can also work with many pressure levels in mind. The tip on the top of your Waterpik flosser can be rotated as necessary. You can move the tip at an angle alongside your teeth to add extra coverage. To rotate the tip, go to the base of the tip and adjust its position. The small grooves on the tip ensure that you can get an effective position on the flosser to help you clear out your teeth and gums in moments. The handle control on the flosser helps you to keep a good grip on the unit. A few buttons or knobs may also be found on the handle. These will let you control the pressure setting and trigger when you will apply water through the flosser. The ergonomic designs that Waterpik offers can work in either hand, thus giving you more flexibility for brushing. The basic Classic Jet Tip uses a pointed body that allows water to flow out with precision. The tip moves water out at varying pressure settings and produces an even flow that targets specific teeth or areas around the gums. The Orthodontic Tip works for people who have braces or other forms of orthodontic work on their teeth. The slightly smaller tip can get under wires to remove plaque that might be tough to reach when brushing. The tip can also move its way around brackets with ease. A few small bristles are found on the end of the Plaque Seeker Tip. These surround the main water port to help you focus on bacteria and plaque from some of the toughest to reach spaces in your teeth. The tip works best for those with bridges, crowns, or implants. A narrow point is included on the top part of the Pik Pocket Tip. The narrow flow of water produced works for cleaning spots under the gum line. People with periodontal pockets or furcations will benefit the most from this. A tongue cleaner tip features a flat body that you would scrape along your tongue while water is administered through the tip. The cleaner will clear out the annoying particles on your tongue that cause you to develop bad breath. The Toothbrush Tip uses a round toothbrush head that helps you to brush and water floss at once. The tip administers water quickly and provides you with a clean feeling every time you use the model. The following steps are consistent for use with every major Waterpik water flosser model you can work with. Review the tip you will use for your flossing needs. Always select the right one based on what you are targeting and how you will clean the surface out. Add lukewarm water to the reservoir. Never add hot water. Depending on the model, you will have to either remove the lid from the top or open the side part of the handle to add the water into the reservoir. You can add a small bit of mouthwash to the reservoir if desired. Adding mouthwash a few times a week keeps the reservoir sterile. Clean off the tip you will use. You may use lukewarm water for cleaning off the surface. Hot water may cause the metal surface to wear out and might impact the fit. Apply the tip to the handle. You should be able to lock the trip in its place. Listen for a clicking sound to confirm when the flosser will start working. Apply the tip in your mouth. Keep it around the back teeth at the start. Do not let the tip directly touch the gums or teeth. Turn on the flosser and start spraying water on each tooth. Apply the water at the top part of the tooth, then the base of the gum, and finally the spaces between the teeth. Be sure to target every tooth in the process. Also, you should keep the flosser on each tooth for about two seconds. Be sure to spit out the water on occasion while flossing. This is to clear out the bacteria that are being broken down. Empty out the reservoir when you are done. This is to keep the water from becoming stale while causing new bacteria to form. A towel may be used for drying off the reservoir body at this point. The process for using the flosser should only take a few minutes. You may also spend about a full minute with cleaning off your teeth. The built-in timer inside your flosser, if applicable, should let you know when you need to move to another part of the mouth or when you are done flossing. My choice for the best Waterpik water flosser is WP-660 Aquarius. The large reservoir and better variety of flossing tips makes this a useful choice that does well with clearing out difficult items stuck in your teeth. The ten pressure settings also help you to keep the flosser working effortlessly and with different settings based on what you need help with cleaning off. 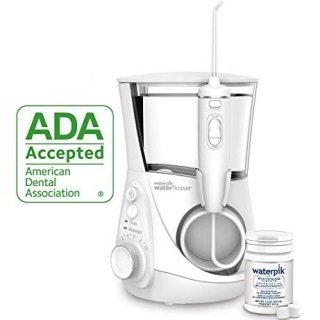 Waterpik has so many different options that anyone can find a water flosser that fits their needs. Water flossers are an effective way to floss and will always leave you with clean gums.